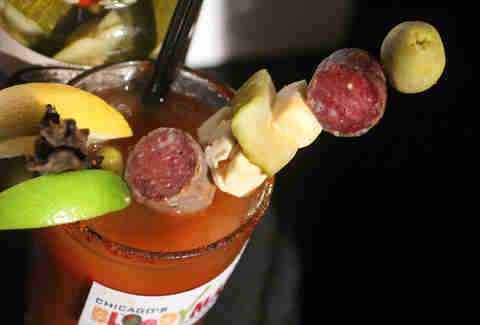 Because you've already tried all 10 of the most ridiculous Bloody Marys in Chicago, we've got a new batch of absolutely insane Bloodys for you (one of them has pizza on it!!! 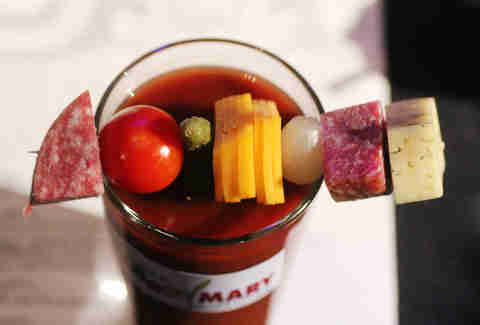 ), all of which were on display at this past weekend's Bloody Mary Competition. Better yet, 13 of the 15 you can get immediately at the bars and restaurants that make 'em (the HQ and Sunda ones are brand-new, but you can probably get those too, if you ask nicely). 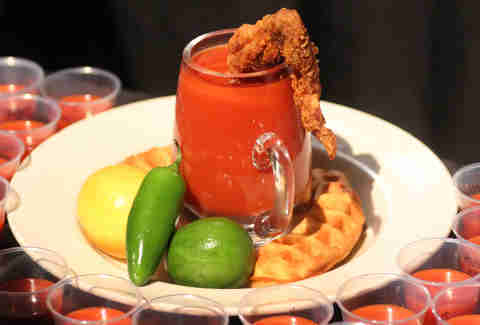 Bloody Mary + Drinkable fried chicken + Jalapeño waffles (!!!!) = Alllll the yes. Awesomely filled with house-Sriracha and smokey BBQ sauce, we're guessing it was still the lardon -- an extra-fatty hunk of bacon -- that played the biggest role in them winning the competition. 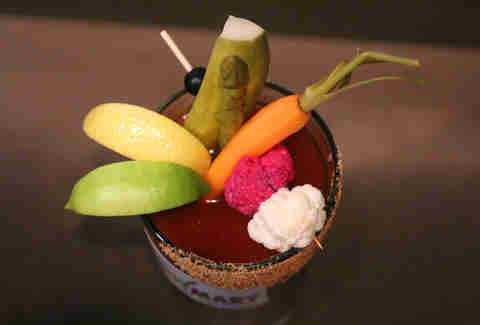 You're on the right path when your drink looks like it rolled around in a football tailgate. 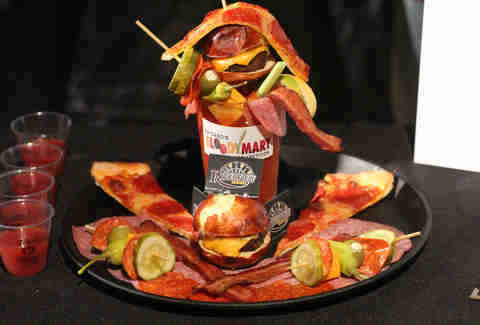 The Hail Mary Fill Your Face Bloody Mary (served on weekends) features: a slice of pizza, a mini-cheeseburger, a pickle, pepperoni, a blue cheese-stuffed olive, pepperoncini, cheddar, smoked bacon, celery, and two slices of salami. 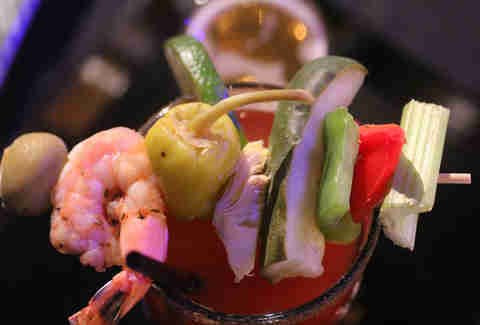 Somewhere underneath all that is their house-made, mix-equipped Bloody. 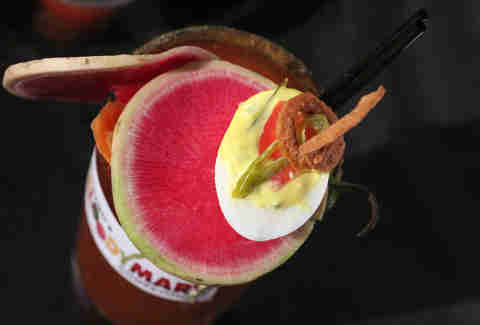 A Chicago dog-style deviled egg and caramelized lemon sit atop watermelon radishes and blistered shishito peppers on Five Star's Bloody skewer. 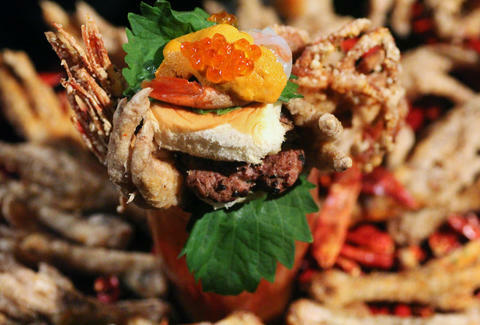 From the team that makes a 32oz Bloody with essentially an entire buffet on top, comes a decadent drink holding up a Wagyu beef & seared foie gras slider, soft-shell crab legs, botan shrimp, salmon eggs, and chicken feet. 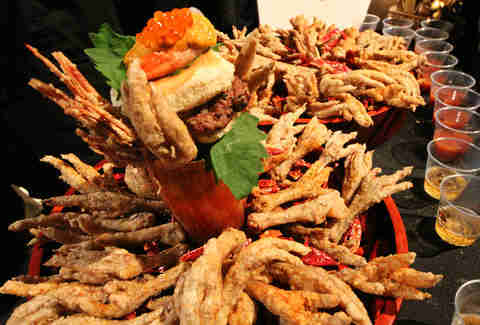 Lots and lots AND LOTS of chicken feet. 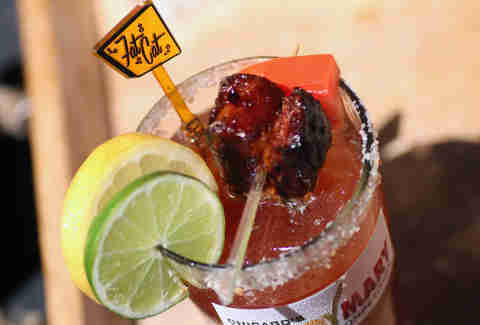 Key ingredients in Three Aces' brunch cocktail include bacon Sriracha, smoked paprika, pickle juice, and Revolution's chocolaty Eugene Porter. 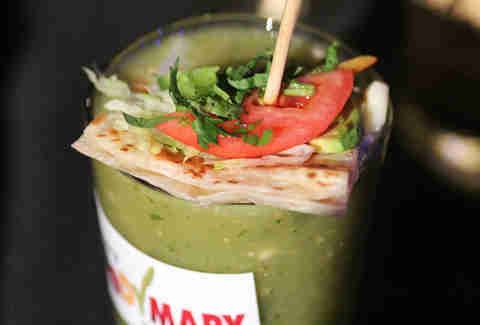 A cocktail that will launch with HQ's new kitchen-equipped River North location, the Hulkish Bloody is colored with green tomatillos, green apples, grapes, and green tea, then finished with... a quesadilla. 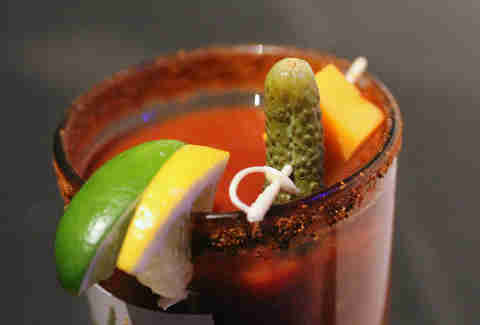 Also known for its Cleetus Heatus made with North Shore Distillery aquavit, Fountainhead brought its standard Bloody spiced with Co-op Habanero Hot Sauce and roasted poblanos, tomatillos, and garlic, then topped it with an admittedly phallic olive & pickle skewer. The whiskey bar keeps things simple with a V8-based cocktail, mixing in the likes of St. Ambroise Oatmeal Stout, horseradish, and Worcestershire, all served in a glass rimmed with Old Bay. L&E also subs in tequila for Bloody Maria's, and whiskey for Bloody Larry's. 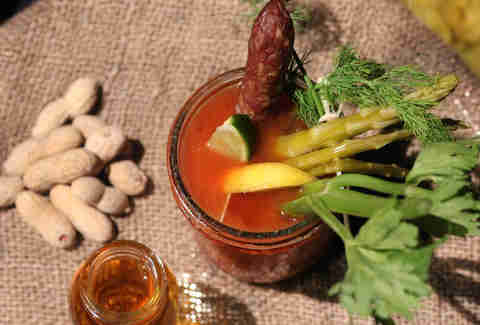 Wash down some complimentary peanuts with a Bloody Mary filled with Sriracha, pickle puree, and muddled lemons and limes, all stirred with a dried Polish sausage (aka how Mike Ditka stirs his coffee). Mixing Frank's RedHot, garlic powder, and both ballpark and Dijon mustard, Paramount Room's Bloody is garnished with dill havarti, cotto salami, cheddar, and a gherkin. 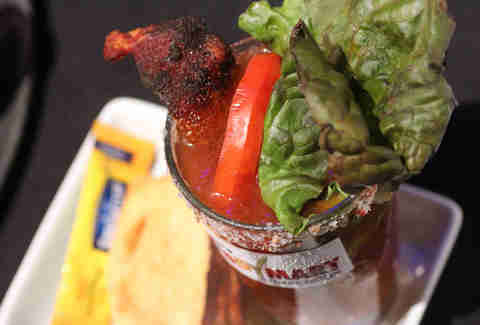 Hash House's liquid version of a BLT also includes a side of white toast with mayo. 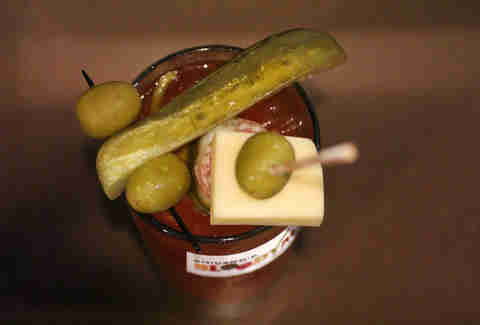 Putting its in-house smoker to good use on the tomatoes, Bub City's patriotic Bloody bar offering comes with a skewer of cheese curds, giardiniera, pimento olives, and pork sticks. The farm-to-table spot has a Bloody laden with jerky, elk sausage (?! ), pickles, and cheese curds with an ancho chili & garlic powder rim. Paired with a Lakefront White chaser, Silver Cloud's small-batch, nitro stout Bloodys are skewered with pickles, peppers, and Cajun cocktail shrimp. 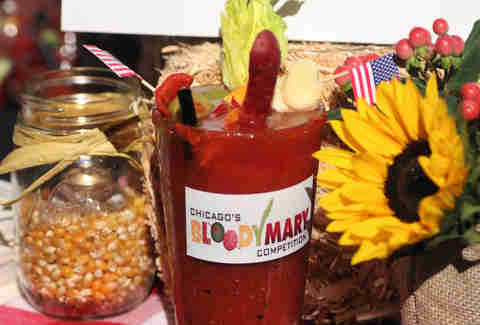 Sean Cooley is Thrillist's Chicago Editor and he is still singing "Sunday Bloody Sunday". Follow him @SeanCooley.